Well it has been a successful season when 22 young people have represented the club in Local league, National leagues and friendly matches. Five of our younger players will be representing the club in the National Championships, three in the U.10's and one U.11 and U.12. 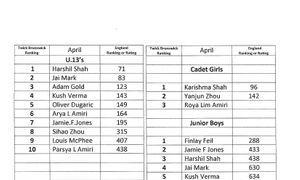 Medha is our highest ranked junior constantly appearing at around 38 in England U.18's. The club membership is in a constant state of fluctuation and while a few members will be dropping out of the rankings we welcome others who are showing the determination work hard at their game to improve their level of play. During the 17.18 season we have been bringing through a number of our younger players and a few older juniors who have started to want to compete. Playing only NCL and NJL means they do not play that often in ranking tournaments, not that many show the enthusiasm to want to do so. However our squad have made good progress this year with still another NJL round to be included in next months rankings. 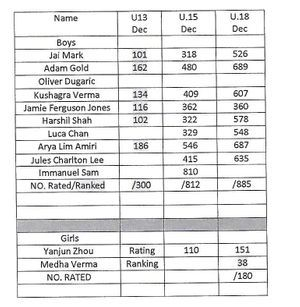 Four of our U.12's in the top 100 and at U.13 we have 10 ranked players with 2 in the top 100. And for the first time ever we have three ranked junior girls. 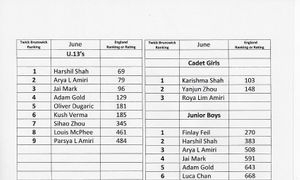 Well done too, to all our cadets and juniors who are making gradual progress within their respective age groups. Normal service is resumed... Its been a while since we have had such numbers on the Table Tennis England ranking lists. We may not have as highly ranked players as in previous years but we are getting there. As you can see from the last list for February we are making good progress and with our players only ever coming once or twice a week. 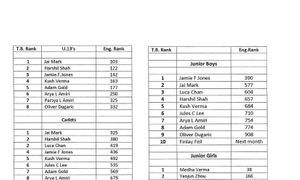 It is also great to have three Girls on the Junior girls list a first for the club. Well the new rankings are out for Feb 2018 and our club members are doing well. We have a few new names appearing but will have to wait another month for some of the results to filter through. The NJL and NCL results from Jan are not included in this month. We have at least three players who should appear next month by the results they achieved in January. 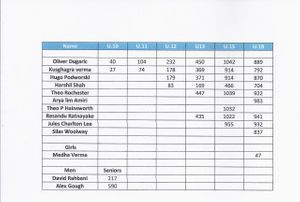 After our first round of National Junior League most of our players have achieved good results. After losing quite a group of players that we had come to rely upon we are now rebuilding and replacing with a younger group. 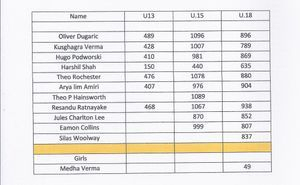 Already we have 6 in the top 200 places in England at U.13. As the new year comes and our new squad play more hopefully we will see further progress and more players added to our squad representing the club. NCL at the end of November 17 saw our top players struggle against strong opposition, while our newer players playing at a lower level continued their winning ways. A hard season in the NCL and NJL saw our teams struggle to win matches. We had to throw some very young and very inexperienced players straight into Division 1 in the NCL. All credit to them they played week after week giving their all with little success to motivate them and with no complaint. It is not surprising that few gained rating/ranking points yet they kept persevering and showed a lot of character. The NJL too was tough but we did come away with a trophy and in this last month nearly all our players made steps forward up the Ranking / Rating list. Well done to everyone keep it up! Well its taken a time but we have a table that is starting to resemble the tables of previous years.The spacing of the NJL and NCL along with delays in results reaching England table tennis has meant delays in rankings coming through. I'm sure over the next month or so we will see some more names being added and some movement in where players are ranked. Below are our players with a current ranking for December 2016. As only one NCL event had been played before the deadline for December, the other NCL and NJL results will be reflected in the January 2017 Rankings and ratings lists. Below are our players with a current ranking for October 2016.... it may look as though our club has disintegrated .... but it is just the result of the England Table Tennis Ranking system. The rankings do not include some good results by some of our NJL players when they played back in December. We now have 22 Emgland ranked players at the club although some will shortly no longer appear as they have ceased playing. Well done to Jules and Luke on their recent appearance on the list and general progress. 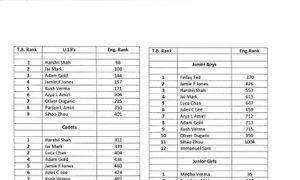 Also to Morgan on improving by 150 and 200 places in the U.13 ad U.15 respectively.